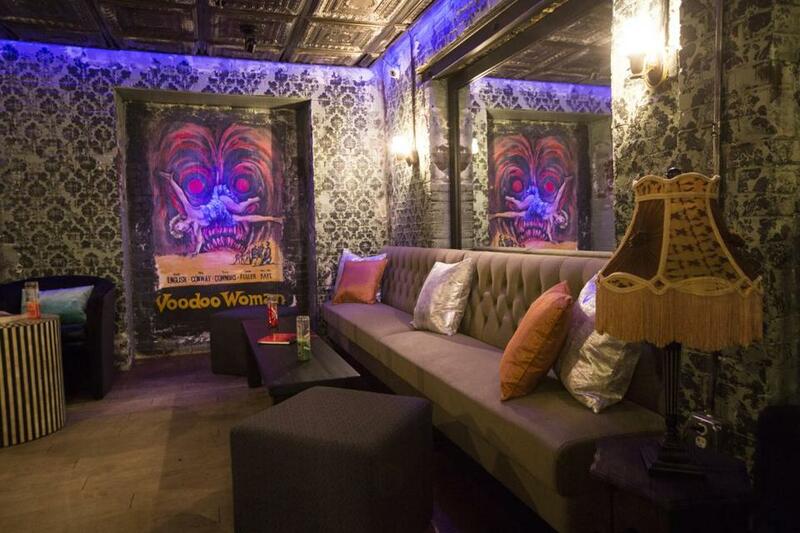 The Voodoo Lounge at Buttermilk & Bourbon in the Back Bay. Where to Buttermilk & Bourbon, a Big Easy-style cavern in the Back Bay. What for Let the good times roll, baby. The scene The restaurant is broken into curtained-off sections that resemble a fortune-teller’s lair, with geographically appropriate names like Bourbon Street and the French Quarter. Chandeliers bounce light off of tin ceilings, giving everyone high cheekbones and an air of mystery. Ornate mirrors and candlesticks adorn the walls. Hedonists should press on past the bar and enter the black-lit Voodoo Lounge, where certain drinks glow in the dark, a surprise that delights several loquacious patrons. Buttoned-up men get louder with each passing cocktail; bejeweled blondes pick at sliders; cheerful chef Jason Santos, he of “Hell’s Kitchen” fame, bounces through the bar area wearing a wide smile. There’s a three-hour wait, but a Hurricane will ease the pain. What you’re eating Rich but gently priced Southern fare (nothing is over $20). Deviled egg toast tastes like the devil’s version of a picnic, laced with crab fat butter and hot pepper salad. Buffalo oysters are drenched in garlic butter and blue cheese; they taste like college at 2 a.m. Fried chicken sliders come two per order but one is plenty, tucked into a potato roll slathered with Tabasco mayonnaise and pickled peppers. New Orleans BBQ shrimp arrives swimming in an ocean of grits enriched with rosemary butter; short rib croquettes are dressed up with “baconaise,” which tastes like, well, meaty mayo. Gulp. Care for a drink? Order a frozen “voodoo” grenade from what looks like a Slushie machine and see what happens to the glass when you step into the Voodoo Lounge. Or try a seductively sweet B&B Hurricane from the tap, which will surely help you consume more than your fair share of baconaise. (Have you reserved your ride share of choice yet?) Many cocktails are bourbon-based, as the name implies; most are $13. Overheard Delight over drinks; chicken chatter; despair over seating. “What? My drink glows in the dark? I need a picture of this!” squeals a woman at the bar, whipping out her smartphone. “You can have one of my sliders. They’re amazing, and there’s no way I’m eating them all,” says another woman to an apparent stranger, sliding her plate down the bar. “This, my friends, is why people get into finance!” yells a man in a zippered cardigan, gesturing toward what appears to be a private party in the Voodoo Lounge. “The wait is, like, three hours, but I’m committed,” a stiletto-heeled woman moans to a pack of pals as they teeter in off the street. Kara Baskin can be reached at kcbaskin@gmail.com. Follow her on Twitter @kcbaskin.